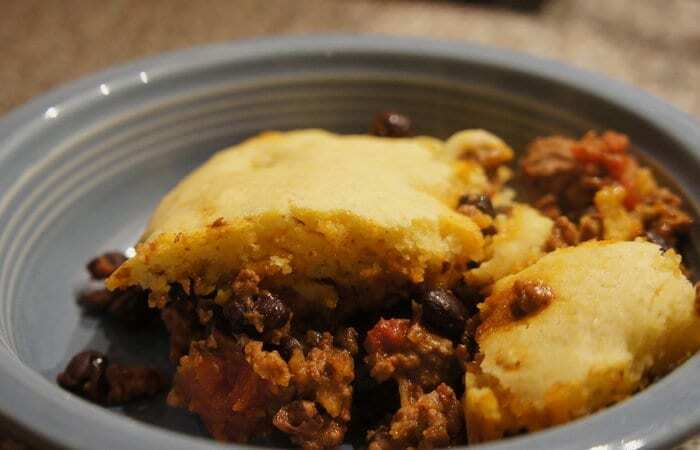 Serve with a mixed green salad with balsamic vinaigrette- Although tamale pie has its origins in the United States, most likely California, many American Hispanics prepare this ultimate comfort food. Not to be confused with Mexican tamales, tamale pie is a baked casserole of ground beef, cornmeal, tomatoes, olives and cheese. I simplified the original recipe, which calls for preparing cornmeal and pouring it into the bottom of a pie dish and again topping the beef mixture with more cornmeal, by substituting a corn muffin mix. A simple side salad completes this family-friendly meal. Preheat oven to 400 degrees. In a skillet, heat the oil over medium high heat. Add the onions and sauté until onions are translucent, about 1 minute. Add in the ground beef and brown the beef for an additional 5 minutes. Season with the salt and pepper. Stir in the chopped tomatoes, corn and olives. Simmer the mixture for an additional 5 minutes while you prepare the corn muffin batter. Prepare the corn muffin mix according to package directions (or use my homemade version below in “Suggestions” or your own cornbread/muffin recipe). Set aside the batter. Pour the beef mixture into a glass pie pan or a 9x9 glass baking pan. Top with ½ the corn muffin batter (you can make the other half into muffins for breakfast: bake at 400 degrees for 15-18 minutes). Sprinkle the shredded cheese evenly on top of the corn muffin batter. Bake for 30 minutes or until cornbread is set and cheese is bubbly. NOTE: If you use the entire batter in the smaller sized baking pans, the cornbread will overpower the beef mixture. If you’d like to use the entire batter, increase the ground beef to 1 ½ pounds and bake the tamale pie in a larger casserole dish (try a 9x11 baking pan). Prepare the salad while the pie bakes: Place washed salads greens in a large serving bowl. In a small bowl, combine the mustard and the following 3 ingredients (through garlic). Add the oil in a slow steady stream, whisking constantly. Season with salt and pepper to taste. Drizzle the dressing over salad and toss to combine or serve on the side for each person to portion individually. Serve with tamale pie. *I sometimes leave the olives out as my kids are not big olive eaters and the dish still tastes delicious. Prepare batter by combining the cornmeal through the next 7 ingredients (through oil) in a large bowl, careful not to over mix. Gently fold in the corn.